Time games are great because they can help children learn to tell time and gain many other skills. Learning to tell time is important because it helps children organize their daily life and follow school schedules. Without the knowledge of time, kids can’t get organized and organization is a key skill that can help children succeed in school. Time games also have other benefits. Time can help children understand basic mathematics. By learning to tell time and by playing telling time games, kids recognize numbers, count up to 60, learn to count by fives or by ones. You can play time games with your child in everyday life. For example, if you go to the post office with your child, look at the clock before leaving the house and look at it while arriving at the post office. If you are baking cookies, set a timer and have your child look at the clock as ten minutes pass. You can also point to the clock often throughout the day and let your kid know what time it is. Don’t hesitate to get you kid a watch or a kid’s clock. Kids usually love clocks and the sound that they make. For younger children, you can start with a children’s digital clock. For kindergarten age children, you can use a face clock. 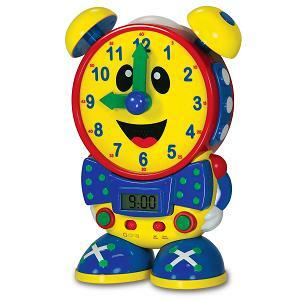 We recommend Telly The Teaching Time Clock (ages 3 and up). What’s great about this clock is that it teaches your child to tell time with both a traditional clock and a digital clock. A great toy for younger children is the Melissa & Doug Shape Sorting Clock (ages 3 and up). This toy combines shape sorting and learning to tell time. Children place the numbered shape pieces in their proper places on the face of the clock and move the hour and minute hands and learn to tell time. The toy is made of wood so it’s very durable and can be passed on to another child. Overall a terrific toy for teaching time. There are also many fun card games that can teach kids time. For instance the What Time is it? Time Telling Game by eeBoo (ages 4 and up) is fun way for children to learn how to tell time. In this card game, players move the arms on their clock faces (the game includes four clocks) to show the time described on the cards. Children gain points for setting clocks to the correct time. Children play this card game in a group or on their own. There are also books that you can get that can teach your child to tell time. One book that we love is the Telling Time from Breakfast to Bedtime (ages 3 and up). In this book, children spend the day with a lovable bunny family from 8 o’clock in the morning to 8 o’clock at night. Every hour, bunnies are busy doing a new activity (eating, napping, playing etc). The illustrations are beautiful. A great book to teach kids about time and the concept of time. Another beautiful book is Telling Time with Big Mama Cat (ages 4 and up). Is this book a cat recounts a schedule of napping, stretching, washing the dishes and waiting for a snack. The book also contains a foldout clock with movable plastic hands which allows children to match the hands of the clock with the time being described by Big Mama Cat.